Let your guests know you appreciate their sharing in your special day by giving them a beautiful glass cross favor. 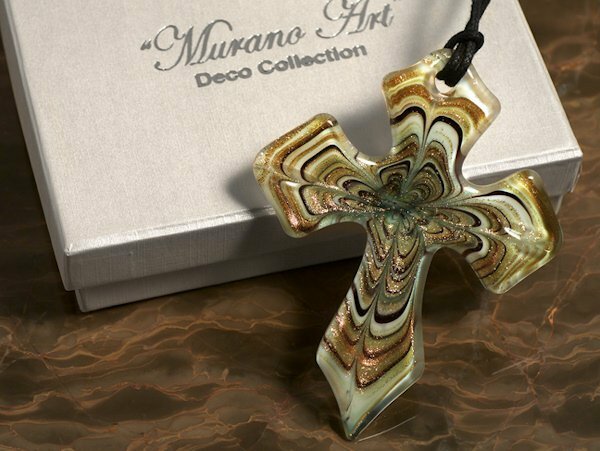 Inspired by the artisans of Murano, Italy, this brown and gold swirl design glass cross will wow your guests with its grace and style. This unique favor is handmade and is attached to a leather string for easy displaying. No two are exactly alike. Each cross is packaged in a two piece elegant white/ivory gift box and set in a pillow soft satin lining. Cross measures approximately 3". Looking at the Blue Swirls Glass Cross wondering if they come in 2" size? Unfortunately, the Art Deco Shades of Gold Glass Cross Favor is only available in 3" size. Each cross also is packaged in a two piece elegant white/ivory gift box and set in a pillow soft satin lining.